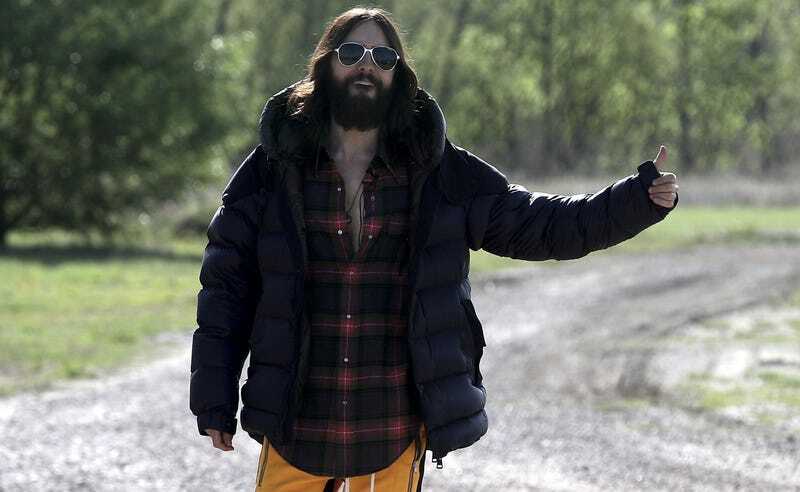 Jared Leto is just along for the ride (and is also inflicting it upon us all). Prompted by the promotional needs of his band’s fifth album, and his natural flair for adventures in relevance, Jared Leto let slip to (ugh) Ryan Seacrest on his radio show earlier this week that he’s going to hitchhike from sea to shining sea, and maybe do some other wanderlust activities while he’s at it. I wonder what Shia LaBeouf thinks about all this. For me, it’s really his opinion that counts. 30 Second to Mars’ fifth album is called America, and it goes on sale Friday. Adam Rippon and his new boyfriend went on a hike. Jussi-Pekka Kajaala is from Finland, get it! Carrie Underwood posted a picture of herself, her first since she suffered a falling accident in November that caused her to get more than 40 stitches in her face.